A recap: never expecting to put together a sequel to Back to the Future, Robert Zemeckis found himself making two, right in a row, each of them telling a discrete standalone story linked by a cliffhanger ending that takes place seconds after the climax of the first movie. In such ways do time-travel narratives offer up all kinds of structural awesomeness. See also "Lost, third- and fourth-season finales of". You would be within your rights to assume that, being filmed essentially as one four-hour movie, Back to the Future, Part II and 1990's Back to the Future, Part III would be of functionally uniform quality. To a certain degree, they are, too: with pretty much the exact same set of creative minds as the second film, from designer Rick Carter to cinematographer Dean Cundey (who in fact shot all three entries), Part III is every bit as confident and slick as its two predecessors; but it is hard to ignore a distinct feeling of deflation. I cannot state with authority that Zemeckis used all his Back to the Future energy in juggling the multiple time frames and overlapping action of the second film in the trilogy, but compared to that film's weird energy, Part III feels a touch sedate. Thus it is always with threequels that are not cartoons about toy mortality. The story you likely know: after receiving a letter from 1985-edition Doc Brown dated to 1885, Marty finds Doc Brown '55 and requisitions his help to first find the DeLorean that has been hidden in a cave outside Hill Valley for 70 years, then to fix it, and lastly to completely ignore the older Doc's express injunction against returning to 1885 for a rescue mission. Soon enough, Marty is in 1885, but the rugged terrain he finds there cripples the car, and Marty and Doc have to find a way to get back to the future; not so easy to get that much iron up to 88 miles per hour in an age before refined gasoline was available on every corner. And there's still the open question as to whether Doc is going back to 1985 or not; between Marty's historical documentation of Doc's death in just a couple of days, and Doc's infatuation with the town's new schoolteacher, Clara Clayton (Mary Steenburgen), it remains a point of contention between the two for most of the film. Over the years, many people have come up with many explanations for what doesn't work about Part III (and many of them still think it's better than Part II, or at lest no worse): the Wild West setting, the Doc/Clara love story, a whole slurry of plot holes - none of which are necessarily holes, though they require a great more thought than the series has thus far demanded. For me, it really comes down to one thing: sequelitis. The joy of Part II is that it pushes against the universe described in the first movie as hard as it can, testing the rules, and generally playing with time travel as a story element in all sorts of ways. Part III is the first movie redux. With some incidental changes, of course, but the spirit is essentially identical: Marty travels backwards in time and can't return with the state of technology he finds there; the only possible plan involves a shot in the dark that can only work once, and if it fails, there's no hope for a second try. Along the way, the bulk of the comedy involves a teenager from 1985 being absolutely befuddled by what he finds in the past. Of course, the specific nature of the drama is different, though this difference much favors the first movie: there he faced an life-threatening crisis brought about by timeline issues, here he faces the life-threatening crisis of an angry man with a gun. 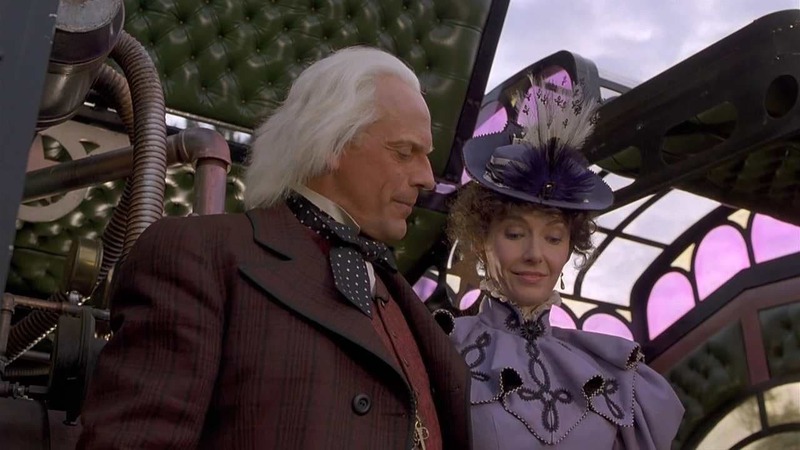 Following the immaculate genre play of the second film, it's disheartening to say the least that Part III treats time-travel as nothing but an excuse for a steampunk Western comedy; I suspect that, though he's never and would never admit it, Zemeckis feels the same way. Or perhaps it was just the stress of eleven straight months of directing Back to the Future movies that led to the uncommon slackness of his directorial hand. Not that Part III is ineptly-directed, Lord no: you would never watch this and muse to yourself, "Wait, did Robert Zemeckis direct this, or Chris Columbus?" But compared to the intense perfection of every last element of a Who Framed Roger Rabbit or a Romancing the Stone, Part III feels a bit loose and imprecise. Yet it still works. In fact, it arguably could not work better for what it is and what it aims for, though I maintain that the conclusion to the Back to the Future saga ought to have aimed for something better. The story, at least, remains perfectly tight, right up until the last ten minutes or thereabouts, which I do not "like"; but I cannot argue against them for any reasons other than those of taste. In fact, the end of Part III brings the trilogy to an entirely effective close: Marty's arc from lackadaisical slacker to bright young man is brought to a perfect close, and one of the final lines sums up the series' philosophy of destiny vs. choice in an entirely coherent and emotionally true way. Everything else is just grousing: the penultimate scene builds off of what was already the lousiest subplot of Part II, the "Jennifer stumbles around 2015, hopelessly confused" bit, and more than anything else in any of the movies, it underlines the division between the first film on the one hand, and the two sequels as a unit on the other hand, which is made to seem contrived and inauthentic. Man, I just do not like the movie once Marty gets back to 1985. But that's probably my problem more than it is the movie's. Still and all, it's perfectly fun and successful for the bulk of its run: the interplay between Marty and Doc remains fresh and energetic, perhaps surprisingly in light of Michael J. Fox's personal tragedy during this half of the double-length shoot (his father died shortly after filming began on the Part III material). Neither actor reveals any hint of weariness, and indeed they both find new things to do and ways with characters who had long since become iconic. The humor tends at times to the juvenile and silly; but so did much of the humor in the original Back to the Future, and at any rate it is good to have a return to straight-up wacky fun after Part II, which is never aught but a comedy, though at times it becomes so invested in its contorted plot that it forgets to be funny. For as much as Zemeckis the director seems to be worn out a bit, presenting imagery without much in the way of affect or insight, Zemeckis the writer, along with Gale, remains fully committed, and as I said all the way at the start, the script is always the true mark of a Robert Zemeckis film. Part III is appealing and funny, it trades on our familiarity with the characters and the tropes of the series without seeming stale, and it resolves a complex story without a single dropped stitch. It's just that it does all of these things without any "spark", that extra blast of imagination and energy that separates the truly great popcorn movies from the good enough popcorn movies. Still, "good enough" is a lot more than most second sequels to cinematic candy like Back to the Future usually manage; and thus did Zemeckis and Gale's final collaboration proved one last time that even when they weren't terribly good, they were still among the most gifted mainstream Hollywood filmmakers of their era.